At times I have a craving to eat something sweet to increase my level of energy. Do you know that feeling? 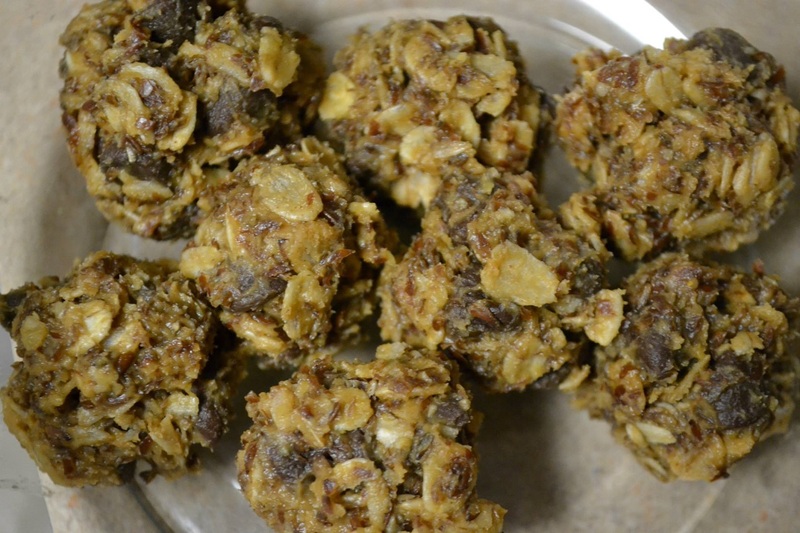 Well, instead of reaching to eat a handful of gummy bears or a reese’s peanut butter cup, I have started to make energy bites. These little flavorful bite-size pieces are sweet, delicious, and best of all very nutritious. 1. Combine all the ingredients and mix well. I like to start with mixing the peanut butter and honey with the rolling oats. Then I add the vanilla extract, flax seed, and chocolate chip. Note that this mixture is rather sticky. 2. Take small portions of the mixture and shape them into small balls, approximately the size of a large cherry. 3. Eat as mid-afternoon-pick-me up, as a pre-hike-quick-energy boost, as a post-hike-recovery-energy boost, etc. I am sure you will be able to come up with plenty opportunities to enjoy this nutritious and delicious snack. Note: Ground flax seed work better than whole flax seed, as they tend to get stuck in my teeth. Also you can easily replace the flax seed with chia seed (make sure they are ground). Or you could use half flax seed and half chia seed. * Honey has traces of potassium, magnesium, and phosphorus, unlike white sugar. Furthermore, honey contains more complex carbohydrates in addition to glucose and fructose. Therefore, it takes longer to break these carbohydrates down than glucose and fructose. * Oats contain vitamin B and E, iron, calcium, magnesium, and fiber. They may be able to reduce blood cholesterol, ease constipation, and help to stabilize blood sugar levels. * Flax seed are a good source of omega-3-fatty acids, vitamin E, iron, calcium, potassium, and magnesium. These little seeds are one of the best vegetarian sources of omega-3-fatty acids. * Peanut butter is a great source of protein. It is also packed with healthy fat (unsaturated fats). It also contains fiber and magnesium. * Dark chocolate may increase the blood flow to the heart and the brain. It also helps to control blood sugar levels and is rich in antioxidants, potassium, copper, magnesium, and iron. Categories: Cookies & Treats, In The Kitchen | Tags: backpacking, camping, chia seed, dark chocolate, flax seed, hiking, honey, oats, outdoor activities, peanut butter | Permalink. I used to eat cereal with fresh fruits and soy milk for breakfast. Well…and then I was trying to increase my protein intake as a nutritionist had suggest that I need more daily protein based on my activity level. So I started making smoothies for breakfast. The combination of ingredients is basically endless. 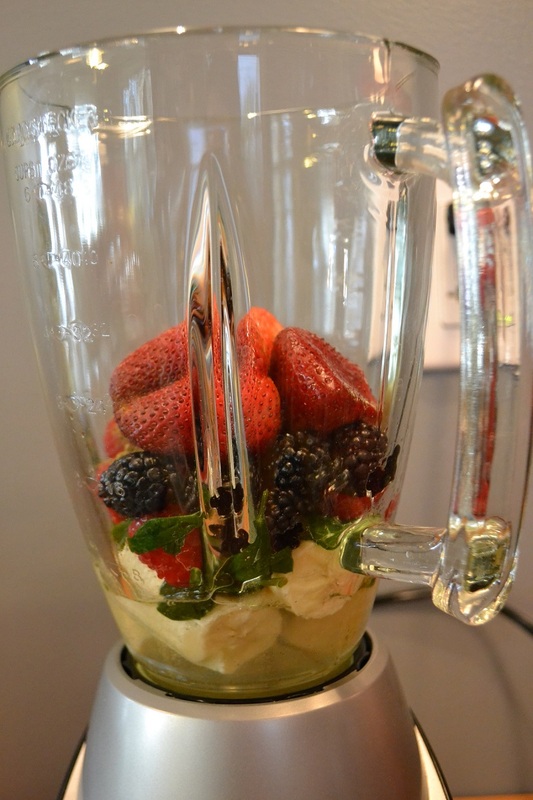 Place all ingredients into blender and blend until well-mixed. Makes about 16 ounces. * I like using fresh green leafy veggies as they are loaded with fiber, vitamins, and minerals. 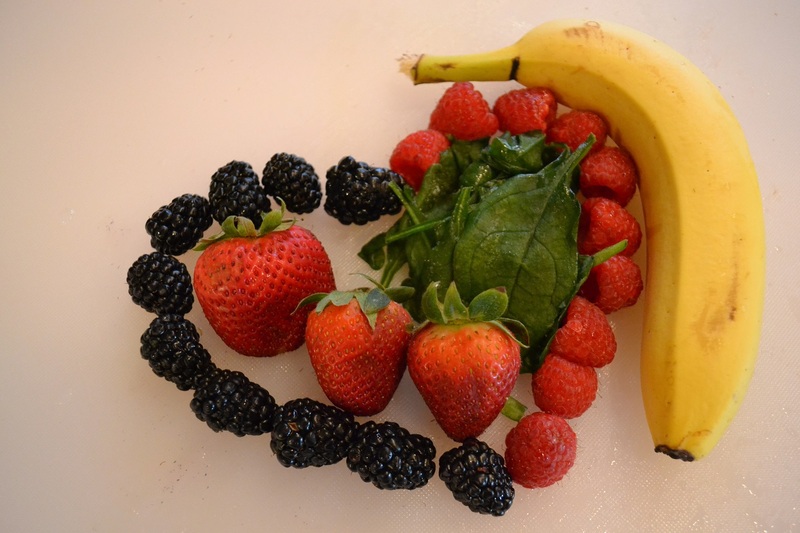 Be careful though, too many leaves added to the smoothie may overpower the flavor of the fruits. 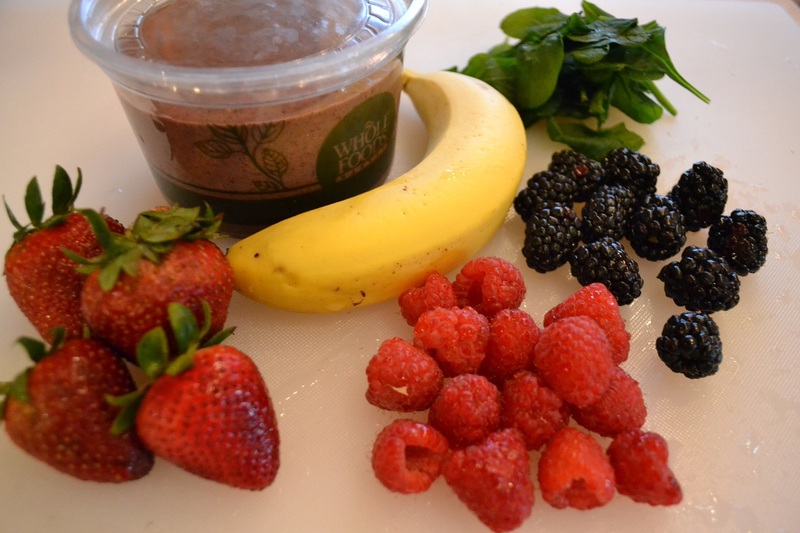 * The smoothie can be stored in the refrigerator for up to three days in an airtight container. I usually use a container from Whole Foods. The very top layer may change color a bit due to oxidization, similar to how the surface of a cut apple turns brown. * Also be careful using blueberries. 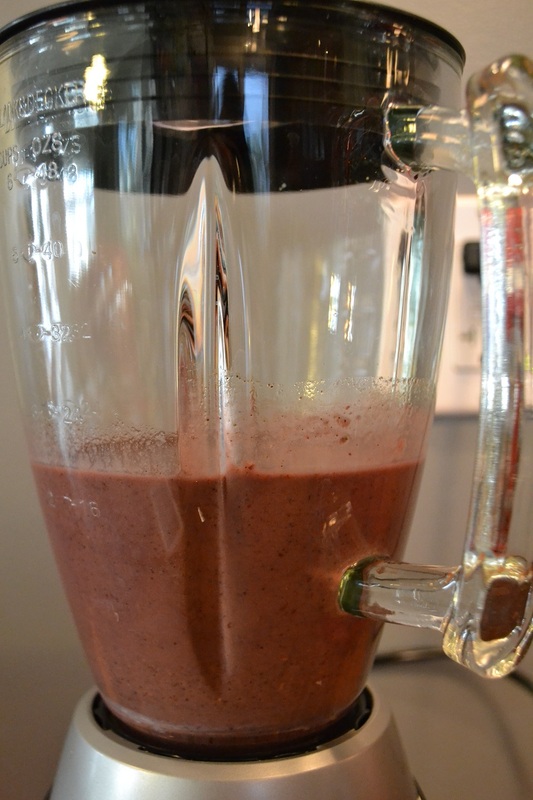 If you use too many, after storing overnight the smoothie resembles “blueberry concrete”. Categories: Breakfast, In The Kitchen | Tags: fruits, green leafy vegetables, peanut butter, smoothie, vegan, vegetarian | Permalink.